Finds (1) & (2) are mirrored versions of find (5) which was also found in Croatia. Notice the swap of colours between the first two roadsigns. 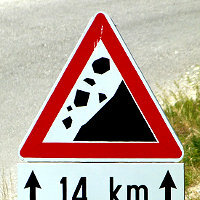 Sign (3) is probably restricted to this part of the former republic of Yougoslavia. It's not reported from elsewhere. It's rather unusual to measure such a large distance in meters. We should perhaps also grant them a ruler to help with the lettering? 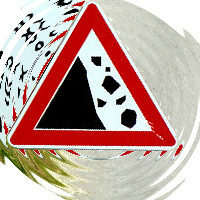 Sign (4) is a mirrored drawing of a roadsign found in Serbia. 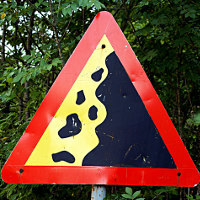 The constellation of the stones is surprisingly close to a common roadsign in France (without the velocity stripes). 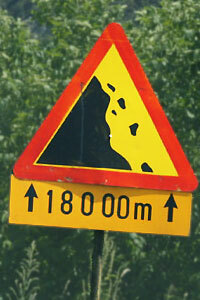 Sign (6) is mounted 120° off the intended orientation, probably to obtain a better fit to the situation. 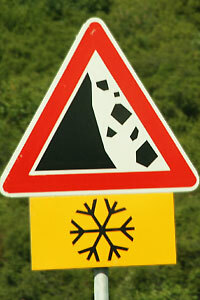 The drawing comes close to sign (2) but differs slightly in both the top and bottom rock. 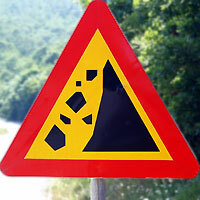 Rotated Falling Rock signs are rather common and you can stumble on them in many countries: e.g. Armenia, Jordan, the Philippines. 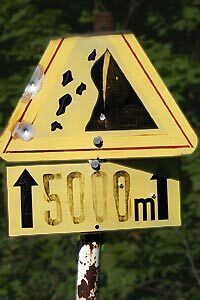 Notice also that distances are now given in kilometers. Sign (8) is a very nice old fashioned panel, clearly related with (4). The stones are rounder and the cliff shows waves like the artist was on hallucinogens.